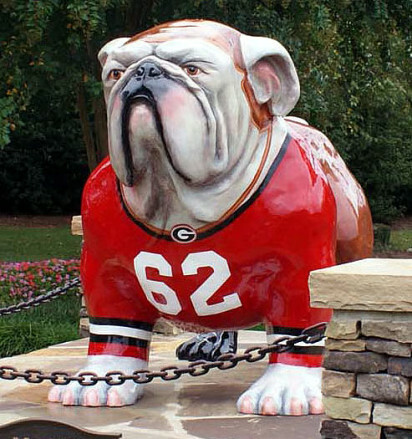 The “UGA Football History Bulldog” is one of four commissioned bulldog sculptures I’ve painted. The sculptures originally appeared in the Athens, Ga area as a public arts project. Measuring around 4 1/2 feet tall, the bulldogs are made out of fiberglass and produced by Cowpainters. This particular project was commissioned by Archie Crenshaw of Athens, Ga. The design is inspired by the proud football tradition at the University of Georgia (UGA). To reference this tradition, I combined elements from both historical and modern day Bulldog uniforms. The number 62 on the uniform is a tribute to former Bulldog halfback Charley Trippi. 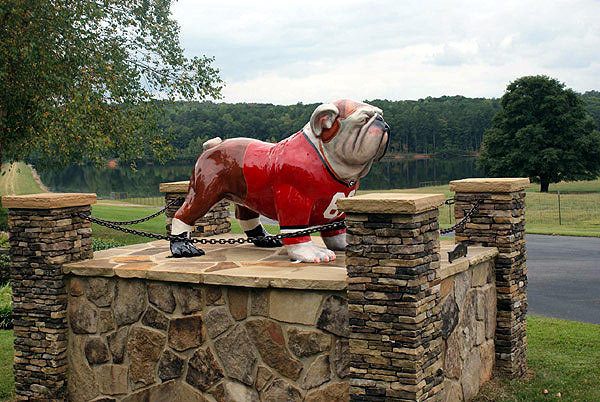 The finished bulldog was coated with polyurethane and is currently on display at the estate of Archie Crenshaw in Athens.